Photoshop Artistry and HDR Photography of Matt Shalvatis: Best of the Year 2010, Part 1. Best of the Year 2010, Part 1. As a photographer, I get connected to my work. Certainly not like a parent develops a connection with their children, although sometimes I think it comes close! Of the hundreds of photos I have put up for display this year, either here on my website or on Flickr, I picked out 34 that I felt were my best. But that's not nearly narrowed down enough. Going through a couple more times, I have finally narrowed that down to my ten favorites of the year. About some of my favorites. Sometimes I want an outcome that reflects reality just as I saw it. And at other times, I want to enhance or alter reality, without going to large extremes (in most cases). So then, how to define my ten favorites of the year 2010? The obvious criteria is that the photo must have been taken in the year 2010. But for a lot of photographers, myself included, photography is a multi-step process, the two most important steps being taking the shot, and post-processing. What if taking the shot occurred before this year, but post-processing occurred this year? Does that count? Should it? For my best of the year, my answer is yes. A shot taken in a previous year, but post-processed this year can count as one of my best of the year. So, here is my year 2010 top photos. I will display five today and five on Friday, in no particular order. And a bit of history behind the photo. Also, to see a larger view of the photo, just click on it and you will be taken to a larger view on flickr.com. Enjoy. 1. 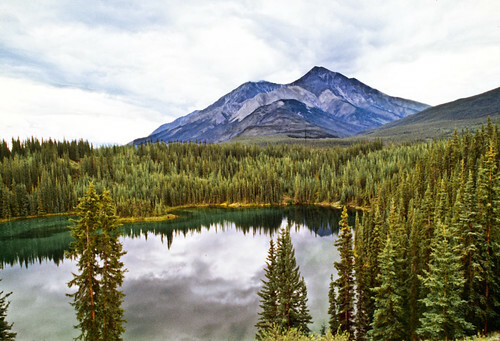 Emerald Lake, Nahanni NP, Canada ~ Photo from August 1999, reprocessed this year. There seems to be something about the process of getting a great outcome from scanned slides. Things that work well on digital files seem to fall flat when tried on scanned film. Maybe I just haven't mastered the process yet. But on this one, I hit the results I wanted. 2. The Golden Gate of Kiev ~ Photo from June 19, 2010. This is a panorama made from two other photos. I then tweaked it a bit using Topaz Adjust. A really pleasing outcome. 3. Gold Domes in January (HDR) ~ Photo taken January 14, 2007, processed for the first time this year. With this photo, HDR made all the difference. I liked the original photo enough to keep it, but never displayed it anywhere until I got this result. HDR and Topaz Adjust. 4. Drama Theater of Chernigov (HDR) ~ Photo taken August 19, 2010. Also a panorama made from two photos. Then created this HDR version, and finished it in Topaz Adjust. 5. Dormition Cathedral, Rear View (HDR) ~ Photo taken January 14, 2007, reprocessed this year. I originally posted a different version of this exact photo early in 2010. I revisited it later in the year and felt I could improve on it. Here are the results.